The European green crab, an invasive species, has been found for the first time in Washington’s inland waters. The European green crab, an invasive species that can eat clams, shellfish and young salmon, has been found for the first time in Washington’s inland waters. The crab was discovered in late August in Westcott Bay, San Juan Island, by volunteers with Washington Sea Grant’s Crab Team. Three experts confirmed that the captured crustacean — a 3-inch adult male — was indeed a green crab. European green crabs, which can stow away on ships, showed up in East Coast waters in the 1800s. 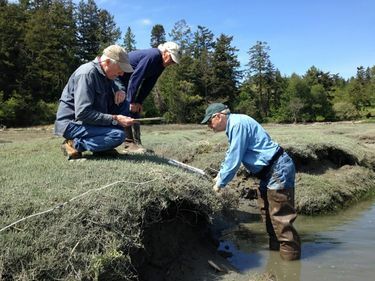 In the Pacific Northwest, the crab has been present for more than a decade in the coastal estuaries of Willapa Bay and Grays Harbor as well as off Oregon and Vancouver Island. 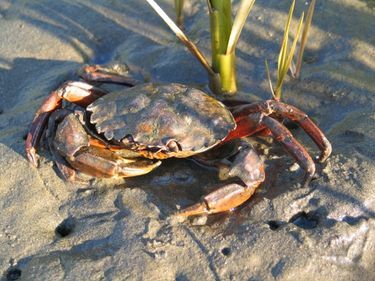 With some 400 possible suitable sites in the state’s inland waters, Washington Sea Grant has sounded a “call to action” for citizens to keep their eyes open for the green crab when they are on the beach. In Washington, the crab is a prohibited species, and possession is not permitted. Anyone who thinks they’ve found one of these crabs is encouraged to take a photograph and report their observation via email to crabteam@uw.edu. More information can be found online at the Washington Sea Grant crab team website.